I remember my first Bald Eagle so vividly. I dragged the guy I had just started seeing (reader, I married him) on a frosty February morning to an eagle walk at Croton Point Park (Croton-on-Hudson, NY). We pulled into the parking lot, got out of the car, and before I’d even had a chance to pull my binoculars out of my backpack, an adult eagle soared right over our heads. I swooned, too transfixed to grab my camera, and marveled at the bird’s majesty. Soon enough I caught up with the group, and we made our way to an overlook along the Hudson River. It was a pretty frigid winter that year, and there were ice floes, which is why so many eagles were appearing so far south. So we were treated to, gosh, I think a dozen birds over the course of our viewing. After the parking lot flyover, though, the second-most memorable bird is the one that pretty much ruined eagles for me. As we stood in the cold, punching up the zoom on our bins, we saw plenty of gulls (Ring-bills, I assume) riding the floes. One had just caught some type of fish from the river. But before it could go down the hatch, a Bald Eagle swooped in and snatched it. Fascinating wildlife viewing? Sure. But also proof that Bald Eagles are just tools. Their thievery is well-noted. 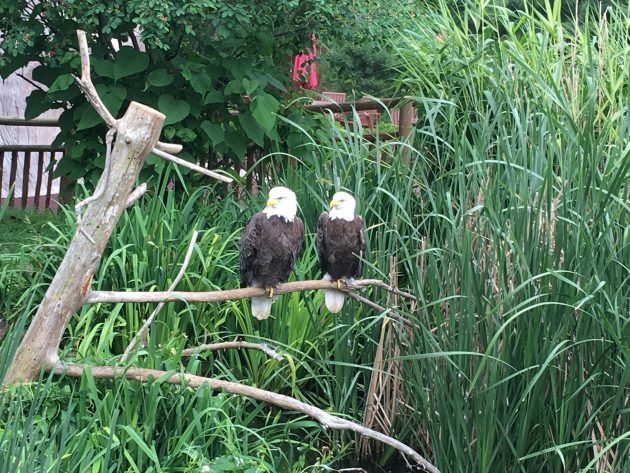 Just throw a rock on the Internet and you’ll hit a post about some slacker Bald Eagle making off with someone else’s catch. (They are literally kleptos! Although this bad behavior may run in the overall eagle Family.) 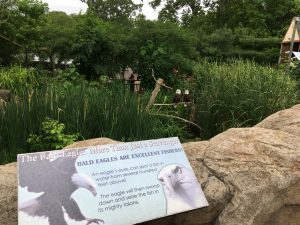 I don’t know who the Elmwood Park Zoo (Norristown, PA) hired to write their Bald Eagle signage (below), but it’s lies—I bet that pair is planning their next heist. That reputation is chief among Benjamin Franklin’s reasons for eschewing the choice of Bald Eagle as the United States’ mascot. (Ben’s complaint mentions raids on the well-earned meals of the “Fishing Hawk,” also known as the Osprey. Unfortunately, the camera doesn’t lie—Bald Eagles will actually poach Osprey babies. Sadly, it appears hardly any creatures are safe from our feathered Captain America.) It’s also worth noting that what we’re all familiar with as the bird’s noble cry (thank you, Stephen Colbert) is a farce, and nothing like the Bald Eagle’s true, wimpy, voice. Sometimes, it seems like Bald Eagles are just being spiteful. Perhaps they’re not so different from their namesake football fans in Franklin’s hometown of Philadelphia. (Yes, Virginia, there really was a Santa Claus who got pelted with snowballs at the Vet. If this is how Eagles fans celebrated winning their first-ever Super Bowl, can you imagine how they would have reacted to a crushing defeat?) And of course, their namesake music doesn’t always fare too well in the court of popular opinion. Will I always stop whatever I am doing to watch a Bald Eagle careening overhead like the boss bird it alleges to be? Hell yes. But that doesn’t stop me from grumbling about how much they really are honest-to-god tools. Why is Jonathan Franzen Embarrassed About Birding? 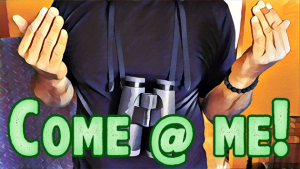 Where Are You Birding This Third Weekend of October 2014?